A Guns N’ Roses fan who was injured when lead singer Axl Rose threw his microphone into the crowd at the end of the band’s Perth Arena concert on Saturday is taking legal action against the controversial star reports The West Australian. 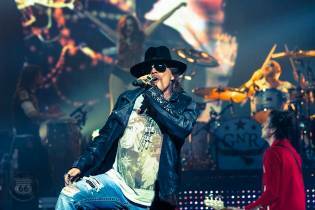 Darren Wright was enjoying the finale of the Guns N’ Roses show, which marked the start of the US band’s Australian tour, when he was suddenly hit in the mouth by Rose’s cordless microphone. Wright said he had a cut lip and lost a chunk of one front tooth, painfully exposing the nerve, and chipped the other front tooth. He said tour promoter Andrew McManus left a message on his mobile telephone apologising for the incident and offering to give him a microphone signed by Rose. “In reality I don’t think the microphone is going to fix my teeth or pay for the dentist,” he said. “I’m a father of four on a single income doing it hard in Perth.” Wright said a dentist told him he would have to have months of dental work costing at least $5000. A Perth Arena spokesman said Mr Wright was given first-aid treatment. Mr McManus was contacted for comment yesterday.